Tricky Walsh is a non-binary artist who works both solo and collaboratively. In this new work, the artist responds to concerns about how we live in a 2D world and everything around us is flat, while light and movement allows us to perceive of three-dimensionality or solidity, and space and our movement through it allows us to perceive four-dimensionality, or time. Walsh considers that perhaps it is a combination of space and light which will allow us to perceive of the 'next-to-be-discovered' dimension. Combining the concepts of Ana and Kata, referred to in the title and theorised by British mathematician Charles Howard Hinton in 1888, referring to two four-dimensional movement directions (Ana: up towards and Kata: down from) the work alludes to and provides a mechanism for looking beyond what we may perceive unaided. Accompanying the Ana-kata-scopeis Walsh’s triptych Instructions for the perceiving of other dimensions2018, part of the artist’s painting practice that has evolved from narrative to abstraction, with a current focus on hard-edge and geometric styles using mathematical methods. 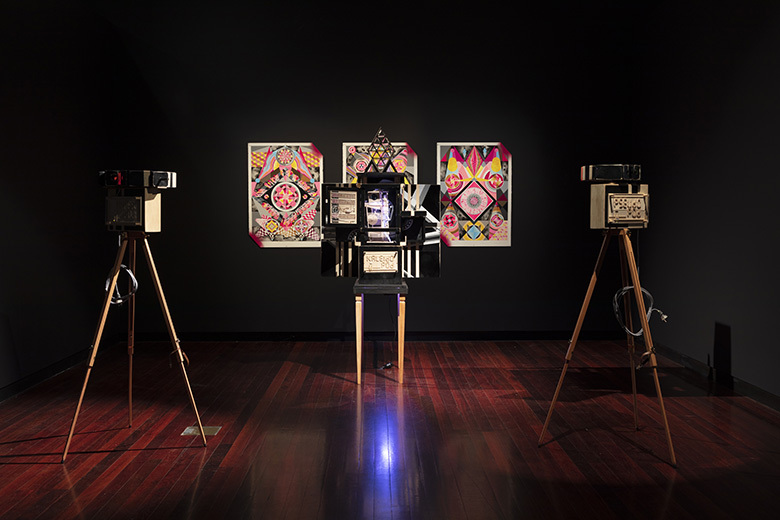 Image: The ana – katascope (v2), 2018 pine, basswood, maple, balsa wood, dichroic prisms, optic fibres, motors, acrylic, kaleidoscope, hyperscope, pseudoscope 1.5m diam. Courtesy the artist, MARS gallery, Melbourne, and Bett Gallery, Hobart.